No pre-registration required. All classes are drop-in based. Pay your teacher directly with cash and checks only. Velocity encourages dancers of all levels to reach their maximum potential. Teaching artists are highly experienced in their art and generous with their knowledge and encouragement in class. Instruction is geared toward motivating the individual student and supporting personal exploration of movement. All classes at Velocity have a strong technical base but are eclectic in their style of movement expression. Drop-ins are welcome at all classes unless otherwise noted. Class card purchases are non-refundable. Class cards expire six months from purchase, and cannot be renewed. All classes are held at Velocity, located at 1621 12th Ave. There is no dress code or required footwear for classes. Please contact the office about specific accessibility needs: 206.325.8773 or operations@velocitydancecenter.org. Velocity’s master classes and workshops provide the perfect opportunity to learn from and share experiences with leading dance artists from around the globe. Master classes and workshops take place year-round and bring internationally renowned artists to Velocity through partnerships with On the Boards, UW Meany Hall, Seattle Theatre Group, and Cornish College for the Arts. Creative / Process classes and workshops are taught by leading movement practitioners and reflect current developments in the field of contemporary dance. Each series takes a multi-faceted approach that integrates technique and creative process. Learn basic dance vocabulary used in Velocity’s ongoing ballet and modern classes with other students who have no previous dance experience. You will learn basic class etiquette and dance technique while developing body awareness and comfort dancing in a group. We will also explore tactics to remember choreography by learning and building on phrases each week. Intro to Dance sets you up to continue exploring contemporary dance classes and other dance forms, and to simply feel more comfortable on any dance floor. Strictly Seattle is a complete immersion to the Seattle dance scene. Five adult programs inspire beginning, intermediate, and professional level dancers with rigorous physical and compositional training in a challenging and invigorating environment. The Seattle Festival of Dance Improvisation (SFDI) is a world-renowned festival that provides the perfect opportunity to learn and share experiences with some of the most highly regarded artists working in the field of dance today. 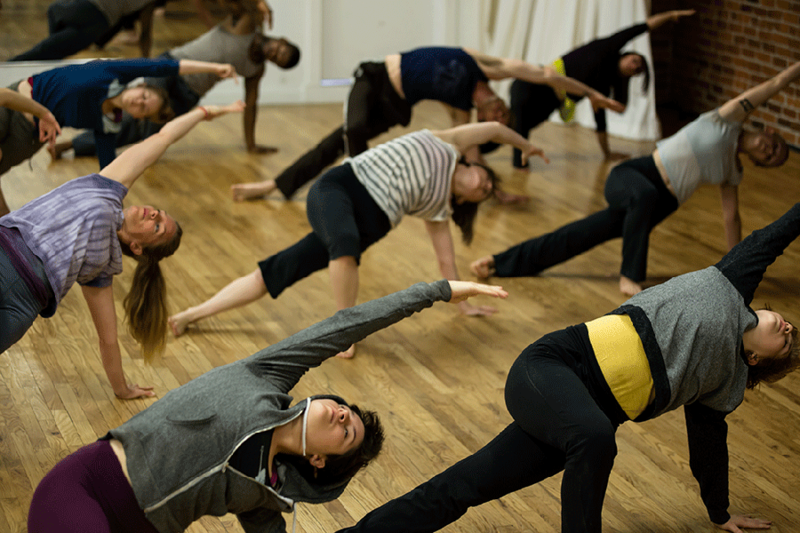 SFDI is a week of intensives, classes, jams, somatic labs, site-specific workshops, performances, and discussions focused on fostering the study and practice of dance improvisation. All studio rental cancellations must be made 24 hours in advance. To cancel, go online and select “early cancellation.” This will then credit your account. To use this credit, you must book the same amount of time in the same studio as the booking you cancelled. No credits or refunds will be processed for cancellations made less than 24 hours in advance. Velocity will refund Workshop registration over the phone up to 7 days prior the start of a workshop or master class. Any cancellation made less than 7 days prior the start of the workshop is not eligible for a refund. Velocity reserves the right to cancel and/or change the date any workshop or master class if there is insufficient demand. In this case, the registrant will have the option of carrying his/her registration to the new date, or receiving a full refund. Any program registrant under the age of 18 needs written consent of cancellation by a parent or guardian.